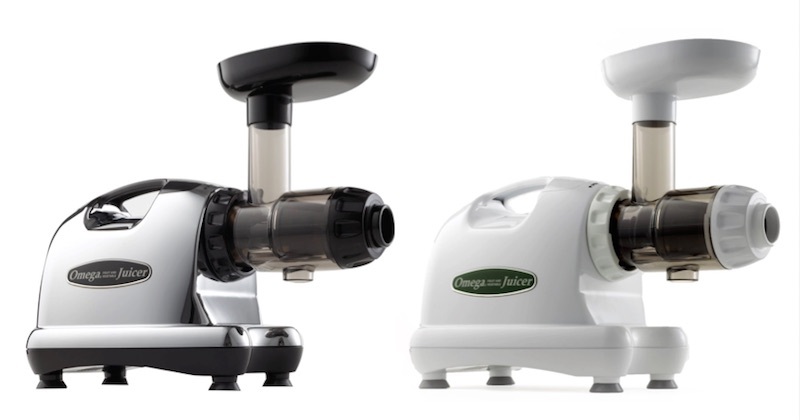 The Omega J8004 and J8006 are twin masticating juicers that are the improved model of the good old twins of Omega J8003/J8005. These four models are fondly known as the J8000 series and are Omega’s best sellers for their quality and durability. These two improved models are really the same juicer sharing all the same functions and features. The only difference is just the color. Omega J8004 has a white body whereas the Omega J8006 is adorned in chrome and black with a price difference of only $40 for the more “sophisticated” look. The Omega J8004/J8006 Juice Extractor, are dual-stage masticating juicers, designed and engineered with two main things in mind: for healthier and more nutritious juices. Omega actually named their juicers the “Nutrition Center” as people are more and more aware of the ability of masticating juicers in extracting juices that retain their enzymes and nutrients. I like the chrome look of this new model, very modern. The attachments are made in black color, a very convenient color if you don’t like to have unsightly pigmentation stains that is likely on the sister model J8004. Worth paying an additional $40 for that permanent “cleaner look”. The number of parts for this machine is very much similar to the older models. 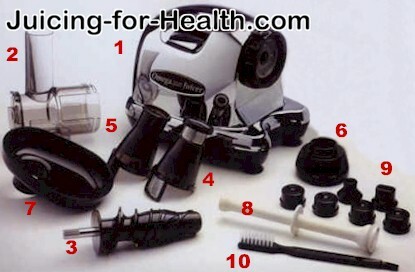 Read my comprehensive review about the equivalent Alpha Juicer. 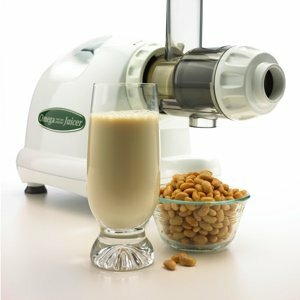 One of the main improvements in this new model is the much acclaimed and patented stone mill-like auger/screw, made of GE’s ULTEM material (# 3 in picture above) that is supposedly 8 times more solid than the other single-gear juicers. This means that there is less chances of the gear chipping when being mishandled. The other Omega juicer that uses this solid US FDA-approved non-toxic melamine, is the Omega VERT VRT330/350HD. 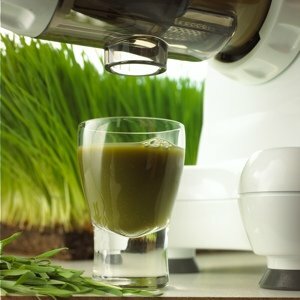 Like most gear juicers in this category, this model is suitable for juicing fruits, vegetables (does this very well), wheatgrass, grinding, mincing, food milling, making soy milk, frozen desserts, and even nut butter. All these functions make the juice extractor a versatile machine that is worth investing in for a modern kitchen. This supposed disadvantage is really to protect and preserve the quality of the juice that is extracted. If you dislike cutting produce but yet want a masticating juicer, you may like to look at the wider-mouth upright Omega VERT or the Kuvings Whole Slow Juicer. Not only do they preserve the precious enzymes and nutrients in juices, the juice yield is much higher compared to that extracted using a centrifugal juicer. The result is juice that is less foamy and that can last longer before it oxidizes. Once you’ve drunk juice extracted from a gear juicer, you would never again go back to a centrifugal juicer. It is a huge and pleasant difference. The price of this juicer is only about $30 more than the older models. The functions are the same, number of parts the same, only that the outward built design is a little different and has a “newer and fresh” look. If you’re serious about juicing and like to be ahead with juicing, this machine will be worth every penny in the long run. If you have a budget constraint, then I would say the basic old model Omega J8003 serves the purpose just as well.